The former leader of Yemen, Ali Abdullah Saleh and his nephew Tareq Mohammed Saleh were killed on December 4th in the capital Sana’a following his declaration of withdrawal from the coalition with the Houthis, and instead sided with his former enemies – Saudi Arabia and exiled president Hadi. However, accused of treason, he was killed by a Houthi sniper while attempting to flee the capital city of Sana’a amidst the ongoing battle. This definitely ended Saleh’s era in Yemen , which started a long time ago, in 1978 , when he launched a coup d’etat . He was the leader of a group of young officers, who came from less privileged tribes and could not get an education, and therefore joined the army. He participated in the Nasserist-inspired Army Coup of 1962, which was instrumental in the removal of King Muhammad al-Badr and the establishment of the Yemen Arab Republic . During the North Yemen Civil War he served in the Tank Corps, attaining the rank of major by 1969. He received further training as a staff officer in the Higher Command and staff C Course in Iraq, between 1970 and 1971, and was promoted to lieutenant colonel . He became a full colonel in 1976 and was given command of a mechanised brigade. In 1977, the President of North Yemen , Ahmed bin Hussein al-Ghashmi , appointed him as military governor of Ta’izz to honor him for his participation in his assassination against President Ebrahim Al-Hamdy. After al-Ghashmi was assassinated on 24 June 1978, Colonel Saleh was appointed to be a member of the four-man provisional presidency council and deputy to the general staff commander. On 17 July 1978, Saleh was elected by the Parliament to be the President of the Yemen Arab Republic , while simultaneously holding the positions of Chief of Staff and Commander-in-Chief of the Armed Forces. In early 2011, following what was called the Arab Spring , the Tunisian revolution which resulted in the overthrow of the long-time Tunisian president, Zine El Abidine Ben Ali , and resignation of Egypt President Mubarak and killing of Libya president Gaddafi and armed conflict in Syria, opposition parties in Yemen attempted to do the same in Yemen. But Saleh tried to escape such fate and offered many political solutions, just as he doesn’t want to meet the same fate of Gaddafi, and doesn’t know that Houthis were going to slay him as he allied with them after his resignation in 2012, following Gulf Cooperation Council’s initiative. On February 2nd, 2011, facing a major national uprising , Saleh announced that he would not seek re-election in 2013, but would serve out the remainder of his term. In response to government violence against protesters, eleven MPs of Saleh’s party resigned on February 23rd. By March 5th, this number had increased to 13, as well as the addition of two deputy ministers. With the Houthis relatively small participation in this protest, Saleh was warning protesters of Houthis, as Saada governorate, Houthis strong-hold town, fell in the hands of Houthi fighters. On June 3rd 2011, Saleh was injured in a bomb attack on his presidential compound’s mosque while performing Friday Prayer. At that time , I was protesting at 60th Street demanding the peaceful overthrew of Saleh and just when we finished the prayer, I heard a speaker announcing the great news in the microphone as he said ” Allahu Akbar, the smoke is rising over the residential palace” . Then reports on international news floated saying Saleh was killed in a bomb attack on his palace. Then he blamed protesters and his Brother in law, acting now as Vice president of president Hadi, of attempting to assassinate him. That explosion killed four bodyguards and injured the prime minister, deputy prime ministers, head of the Parliament, governor of Sanaa and many more. President Saleh suffered burns and shrapnel injuries, but survived, a result that was confirmed by an audio message he sent to state media in which he condemned the attack. The next day he was taken to a military hospital in Saudi Arabia for treatment. According to U.S. government officials, Saleh suffered a collapsed lung and burns on about 40 percent of his body. On 4 June 2011, Vice President Abdrabbuh Mansur Hadi was appointed as acting President, while Saleh remained the President of Yemen. On 23 September 2011, Yemeni state-television announced that Saleh had returned to the country after three months amid increasing turmoil in a week that saw increased gun battles on the streets of Sana’a and more than 100 deaths. Saleh said on October 8th 2011, in comments broadcast on Yemeni state television, that he would step down “in the coming days”. The opposition expressed skepticism, however, and a government minister said Saleh meant that he would leave power under the framework of a Gulf Cooperation Council initiative to transition toward democracy. So Saleh flew to Riyadh in neighbouring Saudi Arabia to sign the Gulf Co-operation Council plan for political transition on November 13,2011, which he had previously spurned. Upon signing the document, he agreed to legally transfer the office and powers of the presidency to his deputy, Vice President Abdrabbuh Mansur Hadi. With Saleh’s post presidency, he was a behind-the-scenes leader of the Houthi takeover in Yemen. Tribesmen and government forces loyal to Saleh joined the Houthis in their march to power especially in the revolution on September 21st, 2014, when Houthis captured Sana’a forcing President Hadi to Flee the capital to Saudi Arabia. After Saudi Arabia launched a war over Houthis on March 26th, 2015. It was on July 28th 2016, when Saleh and Houthis announced a formal alliance to fight the Saudi-led military coalition, to be run by a political council of 10 members – made up of five members from Saleh’s General People’s Congress, and five from the Houthis. Houthi spokesperson Mohamed Abdulsalam stated on his twitter account later after Saleh was confirmed dead that his group had spotted messages between UAE and Saleh three months before his death. By then he already had told Al-Jazeera that there was communication between Saleh, UAE and a number of other countries such as Russia and Jordan through encrypted messages. The alliance between Saleh and the Houthi broke down early December 2nd, 2017, with armed clashes occurring in Sana’a from November 28th. Saleh declared the split in a televised statement on December 2nd on his private channel “Yemen Today” , calling on his supporters to take back the country and expressed openness to a dialogue with the Saudi-led coalition. On December 4th, 2017, Saleh’s house in Sana’a was assaulted by fighters of the Houthi movement, according to residents after they raided his channel and broadcasted the speech of their leader Abdulamlek Al Houthi. While Iranian media alleged that he had been killed on his way to Ma’rib while trying to flee into Saudi-controlled territories after a rocket-propelled grenade struck and disabled his vehicle in an ambush, something his party denied. He was subsequently shot in the head by a Houthi sniper. Houthis published a video allegedly depicting Saleh’s body with a headshot wound. In the video, one Houthi fighter was happy over the killing of Saleh as he shouted at his corpse, “Hey Ali Affash ( Saleh’s nickname), we have avenged Sayyid Hussein”, who is the founder of Houthis group ,and brother of Abdulmalek Alhouth, who was killed in 2004 by Saleh’s forces in Saada. Later, a press release by Saleh’s party confirmed he was killed while on his way to his home town Sanhan, 20km south Sana’a city. His death was confirmed by a senior aide to Saleh, and also by Saleh’s nephew Yahya Moh. Saleh brother Col. Tareq Saleh, chief staff of Saleh Special Forces, also confirmed the death. His death has been described as an embarrassment in a long list of Saudi foreign policy failures under Mohammad bin Salman. The attack also resulted in the death of General People’s Congress’ assistant secretary Yasser al-Awadi. 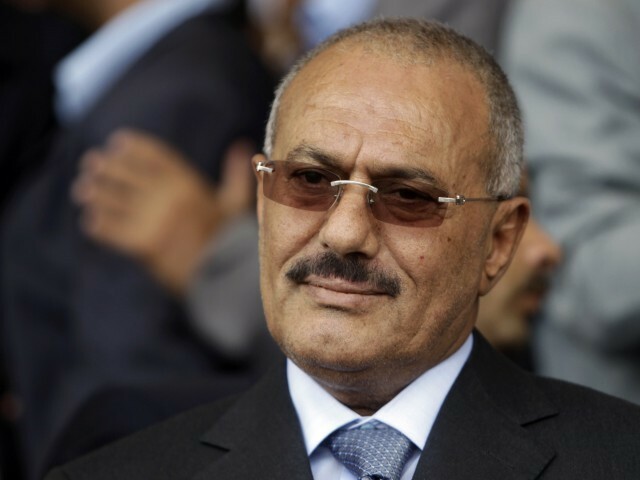 Some reports confirmed that Saleh’s home was captured by Houthis before he fled. Officials of his party, the General People’s Congress, while confirming his death, stated that a convoy he and other party officials were travelling in was attacked by Houthis as they fled towards his hometown Sanhan.